Last week, I was dismayed to learn that I had missed a lunar eclipse on Feb. 9th by 1 day. Someone had made a thread to let us know about it, and I missed it. So I got to thinking - what if we had one thread for all the eclipses, meteor showers, planetary alignments, etc? Then everyone who subscribed should be able to stay on top of the new occurrences pretty easily. So what do you say? This will only work if you use it! If you know of an upcoming meteor shower, planets viewable in the sky, or any other astronomical phenomena viewable from earth, let us know here! Or, if you prefer to create your own thread, post a link to that thread here too so we can see it. Mars, Jupiter, and Mercury will all be viewable in the sky beginning on Feb.16th through Sunday the 22nd. There's still time to see Comet Lulin! 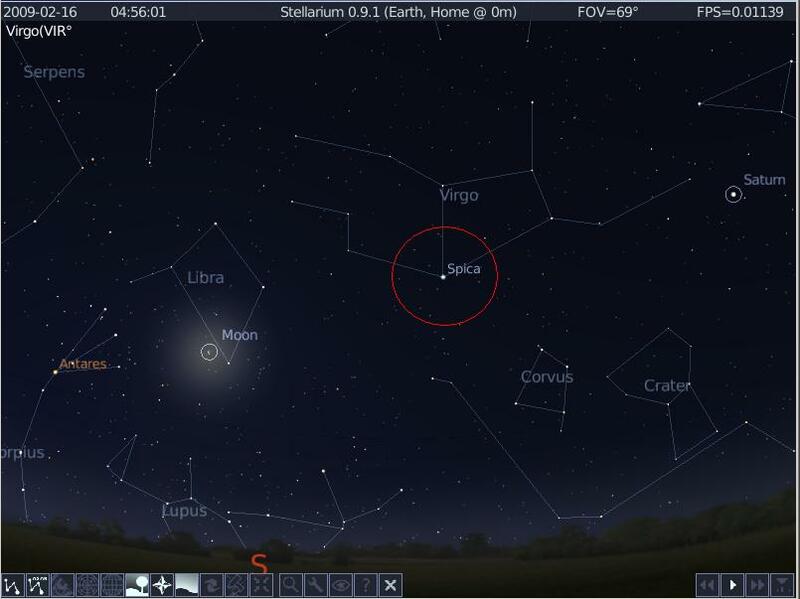 Feb. 16th: Comet Lulin passes Spica in the constellation Virgo. Spica is a star of first magnitude and a guidepost even city astronomers cannot miss. A finderscope pointed at Spica will capture Comet Lulin in the field of view, centering the optics within a nudge of both objects. Feb. 24th: Closest approach! On this special morning, Lulin will lie just a few degrees from Saturn in the constellation LEO . Saturn is obvious to the unaided eye, and Lulin could be as well. If this doesn't draw you out of bed, nothing will. Great idea! i always forget until its too late. i know what i'm doing tomorrow morning! Thanks Ras! You do such a good job of staying on top of these things, I'm counting on you to keep us all informed! here is a visual of where to look for anyone curious..
Aww man , how cool . Right On !!!! At least I've got the closest pass coming up on the 24th to try and catch....please please please. dig it, a green comet ta boot. Back in school I kept up with the astronomy gig a little bit. Took a couple classes in school......8" Celestrron strapped to my back, climbing the mountains at night. God that was the stuff stories are told of... ahhh. thanks guys for doing this. Sweet Dr. THANKS Ras !!!!!! Have You Seen the Zodiacal Light? The first time I knowingly saw the zodiacal light, it was so bright that I couldn't believe I'd never seen it before. I was in Chile, across the valley from the professional observatories at Cerro Pachon and Cerro Tololo. I commented to my host, the superb astrophotographer Daniel Verschatse, that the light pollution from nearby La Serena was unbelievably intense. The light in the west was washing out even the Sagittarius Milky Way, which was quite high in the sky at the time. The pyramid of pearly light reaching from the horizon through the Pleiades (just right of center) is the zodiacal light. Now that I know what to look for, I see the zodiacal light quite often. I've even seen it — just barely — from my astronomy club's observing field in the outer Boston suburbs. But it's much more prominent if you're far from any artificial light pollution. It's well worth the trip. The zodiacal light is brightest and broadest near the Sun. But the very brightest part of all can never be seen from Earth, because it's overwhelmed by the Sun's glare. So your best opportunities come right before the onset of morning twilight and after the end of evening twilight, when you can see the sky quite close to the Sun, but the Sun's light is blocked by our own planet. Most people prefer to view in the evening, so late winter and early spring are the ideal time. Find spot as far as possible from any artificial lights that has a low western horizon. Go there shortly after sunset on a moonless evening and watch for the zodiacal light to appear as twilight fades. What are you seeing? The zodiacal light is the combined glow of countless tiny particles (debris from comets and asteroid collisions) that orbit the Sun. 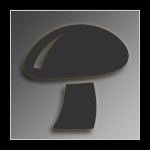 Like the dust in an unswept room, their mass is minuscule but their combined surface area is quite large, so they reflect a lot of sunlight. In fact, if it could be condensed into a single point, the zodiacal light would handily outshine all the planets, including even Venus. As an interesting side note, Brian May, founding member of the rock group Queen, completed his doctoral dissertation on the zodiacal light in 2007, obtaining a PhD in astrophysics from Imperial College in London. He had started the thesis in 1970, but took a 35-year break to become a rock celebrity. NEAT Ras! I didn't know about that! I missed the feb 9th event because of cloudy sky. This thread is a good idea. In fact, if it could be condensed into a single point, the zodiacal light would handily outshine all the planets, including even Venus. hummmm...interesting, so it has an apparent magnitude then ? sweet Ras , no I didn't know this. very cool , I'll be peeled. Ras was that yer shot ? Just caught Stargazer this evening and I hear tell that there will be a really nice view of Venus nearly "touching" a crescent moon come the morning of Friday, the 27th. I gotta confirm this info, but it'll probably be on Jack Horkheimer's site in a few hours. i forgot to post the link.. doh!! Huge Fireball Over Italy. On Friday the 13th at around 10PM US eastern time, sonic booms were heard across Kentucky, windows trembled and buildings shook, and green fireballs exploded over the state. Hours before in Italy, three fireballs were recorded by astronomers. One, captured on video, was ten times brighter than the full moon, and has sparked a scientific meteorite hunt because of its size. Then, on Sunday at 11AM, a fireball so bright that it could be seen easily in direct sunlight shot across Austin, Texas, startling hundreds of people running the Austin Marathon with a resounding sonic boom. Initially, it was thought that the wave of fireballs might be from the recent collision between a US Iridium satellite and a defunct Russian spy satellite on February 10, but NASA astronomer Bill Cook of the Meteor Environment Office says that the Kentucky object was definitely a meteor, and US Space Command, which is monitoring the debris from the satellite collision, says that none of it has as yet re-entered the atmosphere. Meteors strike earth every day, and many involve fireballs. Most hit over the oceans and are not seen. On rare occasions, there have been 'fireball storms,' but it is not known whether or not this will turn into one. We'll be watching the skies. Comet Lulin's vivid green atmosphere is about three times as wide as the planet Jupiter, and its dusty tail stretches more than 1.5 million km into space. The comet is so big that "it no longer completely fits in my telescope's field of view," says Newton. On Feb. 24th, Comet Lulin will swing past Earth only 38 million miles away. Got clouds? No problem. The Coca-Cola Space Science Center in Columbus, Georgia, plans to webcast the encounter. "We're going to transmit the view through our observatory's 16-inch Schmidt-Cassegrain telescope," says astronomy professor Rosa Williams of Columbus State University. "The webcast begins at 11:30 EST on Monday, Feb. 23rd and will continue until 5 a.m. EST on Tuesday the 24th." Tune in! Explanation: Now growing brighter, Comet Lulin is headed for its closest approach to planet Earth early next week. But the comet's greenish glow, familiar to earthbound skygazers, is replaced by false colors in this premier view from the orbiting Swift satellite. Image data from the Swift detectors, normally intended to follow cosmic gamma-ray bursts, were recorded on January 28. 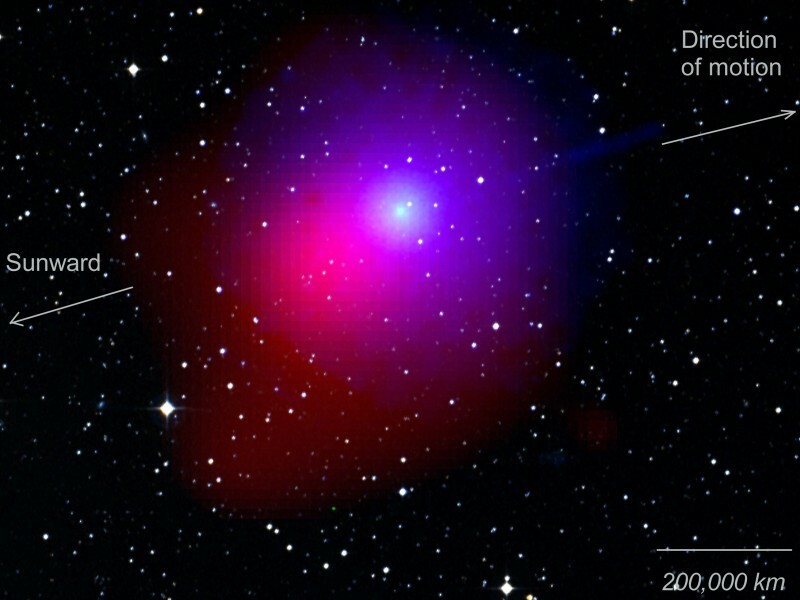 The data are combined here, along with a sky survey image of background stars, to show optical and ultraviolet light in green-blue hues and x-rays from the comet in red. The result maps remarkable x-ray emission on the comet's sunward side as incoming solar wind ions interact with gases in the swollen coma. 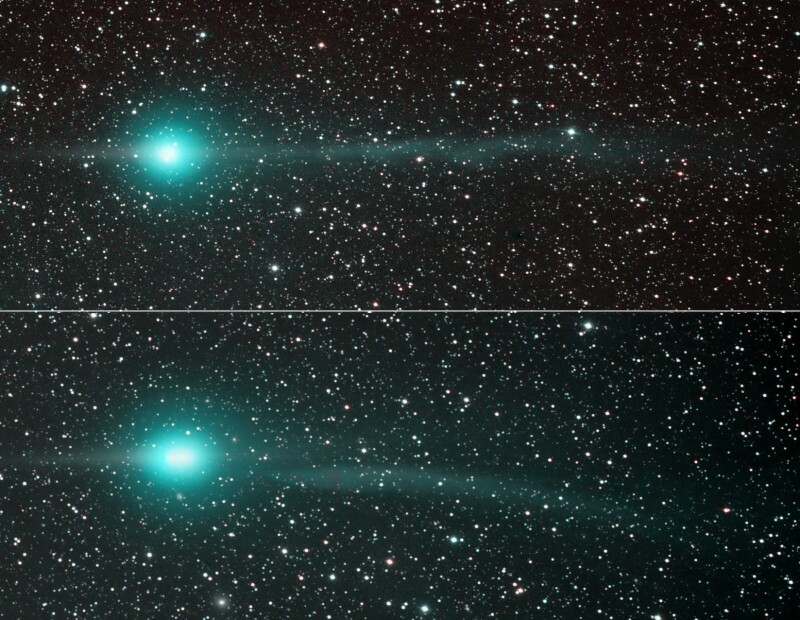 It also shows substantial ultraviolet emission opposite the Sun, in the direction of motion and the comet's tail. The ultraviolet emission is from the OH molecule derived from the breakup of water, an indicator of the copius amounts of water produced by this extremely active comet. In fact, astronomers estimate Lulin was releasing about 800 gallons of water each second, enough to fill an Olympic-size swimming pool in less than 15 minutes. Great pic. Wish the clouds would clear around here. Explanation: Sweeping through the inner solar system, Comet Lulin is easily visible in both northern and southern hemispheres with binoculars or a small telescope. Recent changes in Lulin's lovely greenish coma and tails are featured in this two panel comparison of images taken on January 31st (top) and February 4th. Taken from dark New Mexico Skies, the images span over 2 degrees. In both views the comet sports an apparent antitail at the left -- the comet's dust tail appearing almost edge on from an earth-based perspective as it trails behind in Lulin's orbit. Extending to the right of the coma, away from the Sun, is the beautiful ion tail. Remarkably, as captured in the bottom panel, Comet Lulin's ion tail became disconnected on February 4, likely buffeted and torn away by magnetic fields in the solar wind. 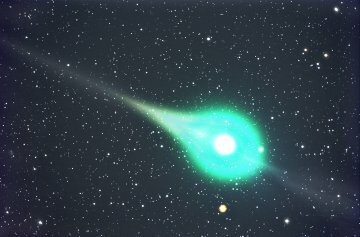 In 2007 NASA satellites recorded a similar disconnection event for Comet Encke. Don't worry, though. 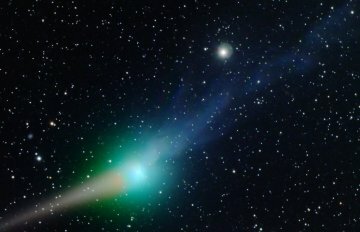 Comet tails can grow back.